Sleep Inn & Suites Davenport offers the best combination of cozy accommodations, friendly service, wonderful amenities and affordable prices. Not only do we offer our guests amazing service, but our hotel is conveniently located right next to Rhythm City Casino and Jumer's Casino Rock Island. Our hotel is the perfect place to unwind after a day at work, exploration or a night at the casinos. Davenport is a vibrant and progressive community that has been declared "The Most Livable Small City in America. Davenport also has a wide range of activities and venues for visitors here to enjoy which include museums, galleries, markets and theaters. Iowa is a very rural state, but one that should never be overlooked. It is charming, quaint, beautiful, and jam packed with places to go. Are you looking to rest and enjoy your stay? 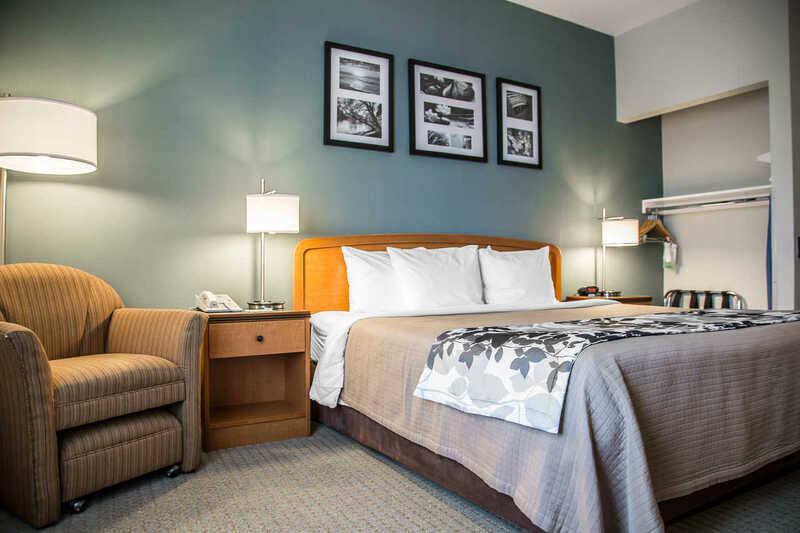 When you book a room at Sleep Inn & Suites in Davenport, you can experience the best hotel hospitality. We always put our guests first and make sure that our amenities best suit your needs. In-room amenities include a business center and a fitness facility. Additional amenities at our Davenport hotel include free continental breakfast, WiFi, and an indoor heated pool. Is shopping your cardio? If so, you're in luck! Shopping in Davenport means seeing people's passion and creativity come to life. With over 70 locally owned shops in Iowa City's downtown, it truly can be your one-stop shop for all the products and goods you need! Make sure you put Crafted Quad Cities, Northpark, SIS International Shop and Abernathy's on your must-visit shopping destinations. There is a plethora of places to enjoy the great outdoors, such as the very cool Spook Cave, the historic Neal Smith National Wildlife Refuge and the secluded Wilson Island State Park. The beautiful and the quirky will always be just around the corner, with the National Farm Toy Museum and Fort Custer Maze, and the whole family will love the rural farm fun with Center Grove Orchard and Bloomsbury Farm - a real taste of the Iowa hospitality and charm! The hottest bars, pubs and nightlife spots in Iowa are right here in Davenport. Discover the popping new casinos and gaming spots in Iowa, at places like QuadRelax or sip some drinks and stay awhile at Barrel House 211, Brady Street Pub, The Blue Cat and Great River Brewery. There are entertainment options that will meet any budget and set any mood. The TaxSlayer Center (formerly known as The MARK of the Quad Cities and the iWireless Center) is a 12,000-seat multi-purpose arena located in Moline, Illinois. The arena has garnered numerous architectural industry awards since its construction. The facility opened in May 1993, under the name The MARK of the Quad Cities with the singer Neil Diamond as the opening act. 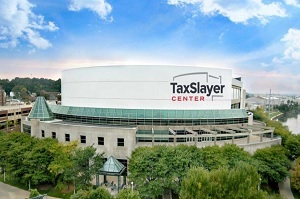 The facility was renamed as the TaxSlayer Center on October 1, 2017. 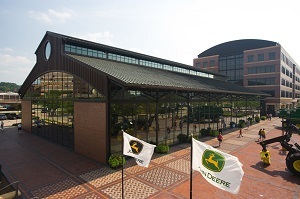 The John Deere Pavilion landmark is part of the John Deere Commons in downtown Moline, Illinois. The pavilion opened in 1997 as part of an urban renewal project and serves as a visitor center for John Deere which has its headquarters in Moline. It also contains that largest store selling John Deere merchandise.Opened in 1997, the pavilion has drawn over 200,000 visitors annually. It is one of the top attractions in the region and contributed directly to the development of other corporate visitor centers such as Coca-Cola and Caterpillar Inc.. 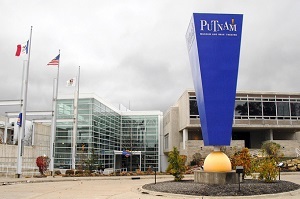 The Putnam Museum is a museum of history and natural science in Davenport, Iowa, United States. The museum was founded in 1867, and was one of the first museums west of the Mississippi River. It houses 160,000 historical artifacts and specimens. It is located at 1717 West 12th Street, at the corner of Division and West 12th Street on "museum hill," near Fejervary Park.The theatre has one of the largest movie screens in the state of Iowa, 57' by 70'. 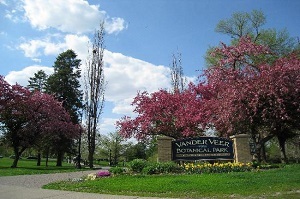 The Vander Veer Botanical Park is a 33-acre (130,000 m2) botanical garden in the Vander Veer Park Historic District of Davenport, Iowa. It is believed to be one of the first botanical parks west of the Mississippi River. The park was listed on the Davenport Register of Historic Properties on August 4, 1993. Vander Veer Park was established in 1885. The park was built on the old Scott County Fairgrounds land and modeled after New York City's Central Park. Vander Veer was originally named Central Park. In 1912 the park was renamed after the first secretary of the Davenport Park Board of Commissioners, A.W. Vander Veer. A conservatory, music pavilion, and decorative fountains were added after World War I. The park is currently maintained by a nonprofit organization, The Friends of Vander Veer. All children are welcome. Free! Up to two children under 17 years stay free of charge when using existing beds. There is no capacity for extra beds in the room. My wife and I had a great stay at this hotel. It was reasonably priced, conveniently located, quiet, and most importantly, it was clean and updated! The service was friendly. The breakfast was good. We would stay here again if given the opportunity! I've stayed here several times over recent years. Very consistent in all respects. Better than other Sleep Inns as to room layout, and price! Good neighborhood for walking, and restaurants. Nice location. The atmosphere at this hotel is exemplary, as is the entire team. I was at this hotel with my job in excess of two months so the friendly staff, clean room and delicious breakfasts were greatly appreciated. Did I mention that Claudia's fresh made to order Omlet was a delicious welcome to begin my day? The breakfast includes fresh fruit and a variety of choices including waffles and other hot and cold choices. Everyone was personable, very helpful and treated me like family. My room was cleaned and vacuumed daily. The on-site laundry and conference room are both a plus. This hotel is by far the best hotel experience I have ever had. Thank you to the team at the Sleep Inn & Suites Davenport for making my stay away from home a great one. I stay here every Tuesday. Check in with Bobby is easy they always have my room ready. Check out with Ben is the same right after a great breakfast ( try the Omelet ) Friendly staff, Good location, Very Clean. Wonderful stay! Great breakfast and the staff is AMAZING! Ben and Bobby were extremely helpful and knowledgeable and took the time to go the extra mile. Room was great, housekeeping was great. This is a great place to stay, and my new personal favorite. Overall it was a great stay! We stayed with the Sleep Inn & Suites Davenport hotel for a weekend getaway and would recommend this excellent, modern hotel to anyone looking to stay. The property was very easy to find. Upon arrival we were greeted by friendly, personable staff who made our check-in and luggage processes a breeze. The room was wonderful, well lit, modern, with all the amenities one could ask for. The room was well stocked, plenty of towels, bed was comfortable, with a microwave and refrigerator. There was a nice sized LCD TV, shower, neat lighting in the bathroom, and great water pressure, and free WiFi. number of amenities provided in room, and quality of staff and rooms, this will now be our go-to hotel property. This is a very nice hotel. While the rooms are large, clean and comfortable, the high point of our stay was the breakfast which included fresh made-to-order omelettes, along with yogurts, cereals, biscuits and gravy, waffles and fresh fruits. Cookies are available in the evening. At a cost of about $110 per night, we still found this to be a very good value. Very friendly hotel staff. Room was large and comfortable. Everything was clean inside and out. Full line of breakfast food was outstanding especially the omelet made to order! I would definitely stay here again. Enjoyed my stay at Sleep Inn. Nice spa, great free breakfast, close to shopping, variety of restaurant choices, easy access to interstate, friendly staff and comfortable rooms. Excellent stay. Very clean. All people we interfaced with were very nice. The breakfast had an omlette bar! I'll be back for another stay when I come back to Davenport. It is in a great location and is close to lots of good food.